An extremely rare Gothic Revival Walnut and Amboyna Bedroom suite designed by Bruce Talbert and made by Gillows of Lancaster consisting of a treble wardrobe, 2 x 3'6" double beds and 2 x matching bedside cupboards. 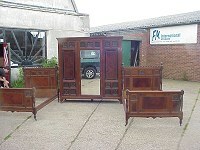 The treble wardrobe with full length bevelled mirror to the centre door with central carved rosette to the top flanked by 2 carved panels depicting 16 carved floret's with further carved rosettes to the side doors and to the lower parts each carved with a different floret on Ebonised and Gilt backgrounds, the central panels of Amboyna framed with ebonised strips and further smaller rosettes to each corner, the front sides with further floret's and carved tramline details, the cornice with dental moulding and all on Egyptian revival feet, the doors opening to reveal hanging space to the left hand side, Linen slides to the upper double right hand side (not shown but all original and all there) and drawers below. The beds and bedside cabinets with conforming identical details. 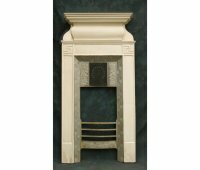 corresponds exactly to ones made by Gillow for the Midland Grand Hotel at St Pancras. 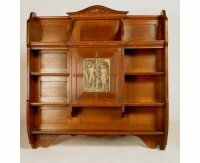 See Arts and Crafts Furniture by John Andrews Printed by The Antique Collectors Club ISBN 1-85149-483-9 page 37 for a comparable sideboard. Wardrobe Height 82 1/2" 208cm, Width of cornice 81 1/2" 208cm, Depth of cornice 24", Beds Height of head board 51", Height of foot board 32", Width 41" 124cm, Bedside cupboards Height 35" 85cm, Width 15" 35cm, Depth 15" 35cm. Circa 1880's. Attributed to Daniel Cottier. An Aesthetic Movement side cabinet, with intricate inlaid geometric patterns and classical jasper circular panels to the upper cupboards with nymphs and fairies and godess on porcelaine panels, but godess of what luna, winged helmets are they both female..
H 79", W 46", D 24 3/4". Jas Shoolbred. An Aesthetic Movement Walnut centre table. 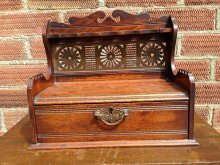 An Aesthetic Movement oak pipe rack with tobacco draw and a pierced brass backplate reminiscent to sketches in Godwins sketch books. Height 10 1/2", Width 12 1/2" Depth 6 1/2". Circa 1870. George Faulkner Armitage (1849-1937), a carved rosewood exhibition quality sideboard, probably made by Collinson and Lock, the moulded cornice with a carved half sunflower frieze, a frieze of overlapping quarter sunflowers, a shelf and mirrors, the base with carved drawers, an open base and panelled sides with full sunflower stiles, on block feet. A Walnut Aesthetic Movement sideboard in the manner of E W Godwin. 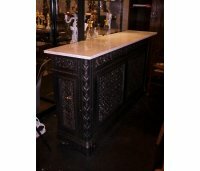 Many of the features of this sideboard relate to Godwin's famous fireplace/Butterfly cabinet which was painted by J McNeil Whistler and exhibited at Paris Exhibition in 1878. Made by Gregory and Co. Regent Street. London stamped mark to a door, no. 1479,. Height 73" 184cm, Width 50" 125cm, Depth 16 41cm" in the middle. Circa 1875. Height 46" 114cm , Width 43 109cm ", Depth 9" 22cm. Circa 1870's. 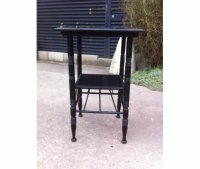 An ebonised side table after a design by Edward William Godwin (1833-86). 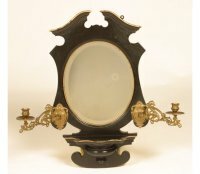 A pair of ebonised side tables, after a design by Edward William Godwin (1833-86). Top one. Height 26", Width 16 3/4", Depth 16 3/4". Circa 1885. Bottom pair. Height 26", Width 16 1/2", Depth 16 1/2". Circa 1885. 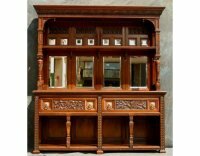 A Walnut wall cabinet with hand decorated tiles. Tiles attributed to Lewis F Day. A rare and early Anglo- Japanese ebonised tall chest of drawers, with gilt painted swallow, stylised bamboo and plant forms with rosettes, with a later black marble top, the lower drawer a double. The last three images are the same as the Cottier corner cupboard illustrated in House Beautiful by Clarence Cook, circa 1878, where you can see the exact same painted devices.. Height 56 3/4" 147cm, Width 23 1/4" 59cm, Depth 21 1/2" 54.5cm. A good quality Aesthetic Movement centre table. Height 28 1/4", Width 36", Depth 36". Circa 1880. 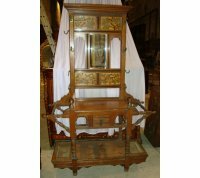 A pure Anglo-Japanese oak Hallstand of very fine quality in the manner of E W Godwin, with upper panels depicting songbirds perched in a cherry blossom tree and a central bevelled mirror with the lower panels depicting apples and pears, the central section with central drawer flanked by arched and half turned details with turned uprights to the front and a strong Anglo-Japanese design incorporated into the umbrella/stickstand compartments to each side with Sunflower carved details to the front and back with a lower shelf encorporating the drip tray compartments to each side with zig zag detailing to the chamfered edges all stood on turned ball feet with shaped supports to each side. Height 73 3/4". Width 78", Depth 17 1/2". Circa 1870. A Rare and Important Aesthetic Movement display cabinet. Probably made for Bushloe house and originally bought in Leicestershire where Bushloe House was built. This outstanding commissioned piece has all the character intimate to Dresser. On close examination of the Frog wardrobe, dressing table, chest of drawers and dressing table mirror designed by Dr C Dresser which also came from Bushloe House exhibited in Harry Lyons shop New Century in Kensington Church Street where I was lucky to examine it many times (I later bought the shop from Harry) and after close inspection of the bedroom suite while it was there and also the cabinet they would all seem to be made by the same maker, the Ebonising is quite thick and the gilding is also applied with a number of coats. The construction also points it to Bushloe house pieces. 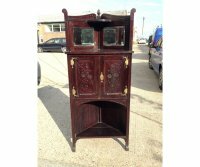 As you can see there are many elements particular to Dressers intimate style especially the Elephant sidetable and the Elephant corner chair both in a similar style as this. Height 95", Width 60", Depth 21". Circa 1871. 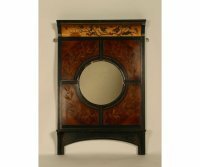 Bruce Talbert (attributed), an ebonised single drawer cabinet, with upper gallery and ivory inlays to the upper doors of men amongst floral details in Mannerist style within an oval, flanked with squirrels to each corner. 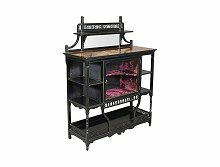 the semi-circular side supports with trefoil cut-outs to the backs and turned supports to the fronts, with two lower shelves and a pierced gallery, on turned feet. 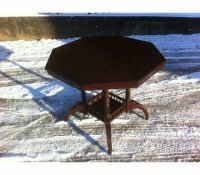 Edward William Godwin (after), a walnut square occasional table. 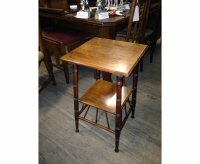 Made by Wells and Co. Bedford, on ringturned supports united with an undertier. Height 26 1/2" 70cm, Depth 16 1/2" 42cm. Circa 1880. A pair of Anglo Japanese side tables after a design by E W Godwin. 16.5" square, Height 26.5". Circa 1885. 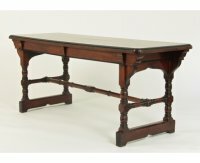 I do come across variations of this table in Walnut or ebonised from time to time. I have six in stock at the moment. Feel free to enquire. Dr Christopher Dresser (attributed), an ebonised music cabinet, with six painted panels attributed to Moyr Smith, the upper pair in the shape of crosses with painted Japanese floral details, the central pair depicting a violinist and a harpist sitting on a Greek stylised chair, the lower pair square shaped with applied circular cross and Japanese flower, the doors with incised geometric latch style handles enclosing ten drop-front drawers, compartments to the base. See Lyons, Harry �Christopher Dresser: The Peoples Designer 1834-1904�, p. 144, plate 260. Height 46" 120cm, Width 31" 79cm, Depth 19 1/2". Circa 1870's. A Marsh Jones and Cribb stunning quality Aesthetic Movement Walnut filing/music cabinet with pierced back flanked by capped uprights and subtle upper sides high lighted with ebonised lines with an open area to the top and fabulous carved stylised floral doors the carving of superior quality and in 4 seperate panels highlighted with ebonising and the doors opening to reveal sliding open drawers, the lower sectiction divided by 4 crisply turned supports. Height 52 1/2", Depth at top 14" x Width 18". Circa 1870's. Attributed to W.R.Lethaby. 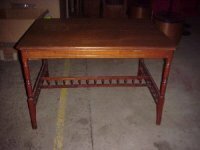 A good two drawer Gothic Revival/Aesthetic library table by Marsh Jones and Cribb (Late Kendal works) with original paper label to the underneath. 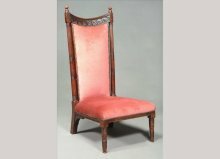 Marsh Jones and Cribb were important furniture makers in Leeds in a similar league to Gillows of Lancaster specializing in Medieval or Gothic Revival furniture, they made from C1865 under licence to Charles Bevans his famous 'New Registered reclining chair' and Bevan designed for them until C1867. M.J and C' made all the furniture for the marital home of Titus Salt Junior in Basildon near Saltaire and also made furniture to the designs of Bruce Talbert. W.R. Lethaby became their head designer in the 1880's. Height 31", Width 2'1" 63cm, Length 6'1" 184cm. 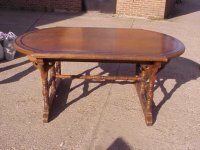 A matching dining table to the above Library table and also made by Marsh Jones and Cribb with original paper label to the underneath. See above table for the history. 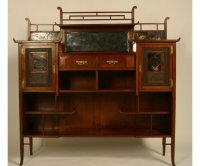 An Anglo-Japanese sideboard in the manner of Thomas Jeckyll with stylised fret work almost identical to his designs for Barnard Bishop and Barnard with Amboyna serving area possibly designed by by W J Estall. 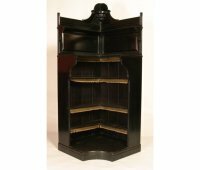 Lambs were one of the very best cabinet makers of the period a pure Art Furniture company who's furniture designs were at the forefront in England in the late 1800's. Alfred Waterhouse is also believed to have designed for them. £POA. 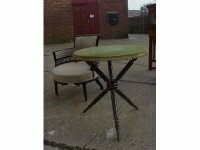 A set of 4 matching dining chairs below. Made by Lambs of Manchester. Height 53 1/2", Width 42", Depth 16 1/2". Circa 1875. Lambs of Manchester. 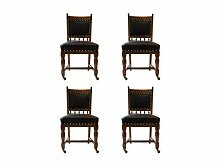 A rare set of 4 Walnut Aesthetic Movement dining chairs with circular carved details and ebonised turned and incised details, a cup handle to the back of the head rest on turned front legs with brass and ceramic castors and a wonderful kick out back leg united by a H stretcher. Made by Lambs of Manchester, stamped on the top of the door. 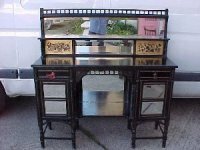 An ebonised Anglo-Japanese cabinet of supreme quality with Amboyna serving area possibly designed by W J Estall but very much in the style Of T E Colcutt like E W Godwin Colcutt also designed for Collinson and Lock and his ebonised furniture shown in Philadelphia and exhibited at the Paris Exhibition in 1878 contributed to the fashion and style in the United States at that time. Alfred Waterhouse is also believed to have designed for Lambs. 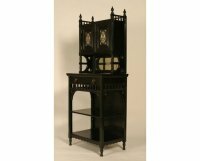 Lambs were one of the very best cabinet makers of the period a pure Art Furniture company who's furniture designs were at the forefront in England in the late 1800's. £POA. 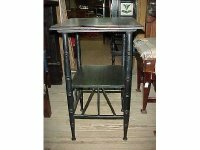 A set of 4 matching dining chairs above. Height 6' 11", Width 44", Depth 17". Circa 1875. 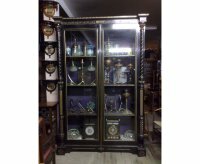 A rare Heal and Son pure Aesthetic Movement ebonised bedside cupboard with marble top and incised gilded decoration with a subtle Dr C. Dresser influence. Stamped Heal and Son London on the top of the door. Width 16" Depth 14" Height 2' 11". Circa 1875. Heals started making furniture in 1801. 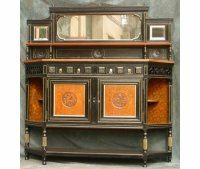 Ebonised and Gilded Aesthetic Movement sideboard attributed to Bruce Talbert 1838 to 1881, he originally trained as a wood carver and later trained as an architect but his main activity was in domestic furniture design. 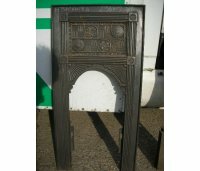 He also designed metalwork, cast ironwork, wallpapers, carpets and textiles for many important and prestigious companies of his time. 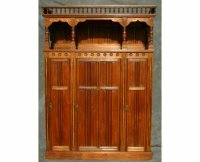 The side cabinet is very probably made by Gillows of Lancaster, they were in business from C1729 to C1900 probably the most important furniture making company of that time. Numbered 1150. Height 60" 150cm, Depth 1'3" 39cm, Width 4'9" 144cm. Circa 1875. 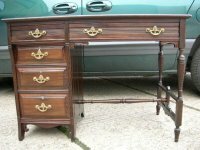 A good quality Lambs of Manchester Aesthetic Movement writing desk with leather work area to the top a bank of four graduating drawers to the left and a large upper drawer to the right with turned and fluted legs to the right united by upper and lower side stretchers with wonderful detailing probably designed by Estell. Height 28", Width 39", Depth 21". Circa 1880. A cast iron stickstand by Robbins and Co attributed Thomas or Henry Jeckyll. Barnard Bishop and Barnard co produced with Robbins. 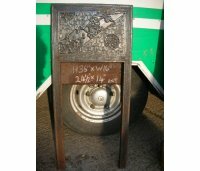 Height 34" 84cm, Width of base 20" 51cm, Depth of base 10". Circa 1875. A little Aesthetic Movement cast iron fireplace with peacock feathers to the centre and 2 love birds just below flanked by Sunflowers attributed to Thomas Jeckyll. Height ", Width ", Depth ". A pair of Aesthetic Movement cast iron fireplaces with a peacock sat on a tray above a wind God attributed to Thomas Jeckyll and probably made by Barnard Bishop and Barnard. Height 36", Width 17". Circa 1875. 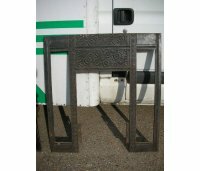 An Anglo-Japanese cast iron fire insert designed by Thomas Jeckyll and made by Barnard Bishop and Barnard of Norwich. 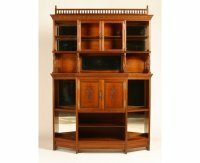 A Superior quality display cabinet in the Anglo-Japanese style with restrained inlay to the door, wonderful stylised leaded and coloured glass to the door, sweeping apron above and sweeping lower shelf. There is another shelf behind the inlaid panels of the door, three more behind the glass. Height 49", Depth 14", Width 20". Circa late 1890's. 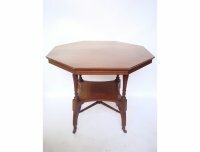 Large Walnut centre table in the manner of E.W.Godwin, superb quality. Length 44 1/2", Width 32". Circa 1880. 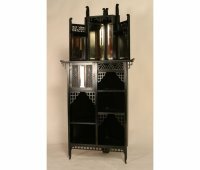 An Ebonised Aesthetic corner cabinet with carved floral detail to the top and to the doors flanked by stylised hinges and handle, kick out front legs. The colour looks lighter in these pictures but it is actually almost black (ebonised). Height 63", Width at front 27", Depth 14". Circa 1880. 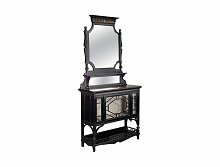 An Ebonised Anglo/Aesthetic sideboard with upper turned gallery above two bevelled mirrors, flanked by hand painted Buddleia, floral panels with butterflies and Moth's, with two drawers and two cupboards and an open lower shelf. Incised Gilt decoration throughout and twin arched front lower section joining eight turned and gilt legs. Probably made by Gillows. Height 56" width 54" depth 17 1/2". Circa 1875. Aesthetic Movement 'Gypsy' Side Table. 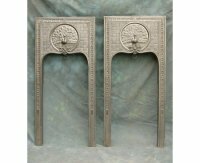 A Pair of Walnut Aesthetic Movement wall brackets in the manner of John Henry Chamberlain 1833-1883 (Architect) with semi-circular shelves a turned gallery below and hand painted roundels of a Swan and a Crane on a river seen (a little distressed) and turned knobs. Chamberlain was also Chairman of The Birmingham School of Art Committee. The candlesticks are attributed on stylistic grounds to Dr C Dresser see metalwork pages. Height 11" width 15 1/2". Circa 1880. 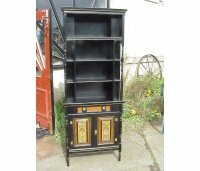 An Aesthetic Movement ebonised small dresser in the manner of E W Godwin. Possibly made by Gillows of Lancaster. Height 67 1/4", Width 40", Depth 18 1/2". 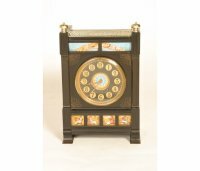 A black marble brass gong-striking movement mantle clock with an Arabic numeral 6.5 inch dial with a painted central sunburst,with hand painted panels of the 4 seasons to the base and Signs of the Zodiac to the top. Height 16 3/4" 42cm, Width 11 3/4 27cm", Depth 6 1/4 15cm". An impressive Marble mantle clock attributed to Bruce Talbert (for a similar example See 19th Century Design by Michael Whiteway and Charlotte Gere page 119) of triangular Architectual form with angled top and a Bronze circular device just below, stylised Gothic Floral details to the side and central lower section flanked by Bronze columns with Ormulo mounts to the top and bottom, on a solid brass base. 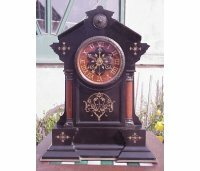 The face with Roman Numerals incised into red marble, the centre I believe is black marbel with gilded stylised pointers seperating each hour and the hands are gilded brass the bezel is bronze with bevelled glass. £POA.Height 18", Width 14", Depth 6 1/2". C1875. 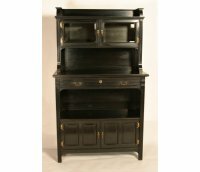 An ebonised open corner cabinet. 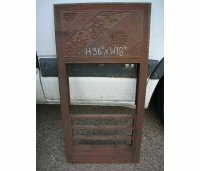 Height 69 1/2", width at front 31", Depth at back corner to front sides 26", Depth at back corner to centre front 31". 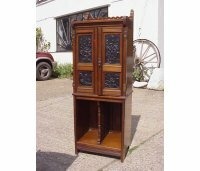 An Anglo-Japanese butterfly corner cabinet. Height 64", Width at front 30", Depth down each side 21". 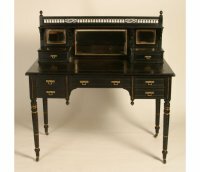 An Ebonised and Gilt Aesthetic Movement desk with leather writing area. By Maple and Co, stamped to locks. Height 46", Width 45", Depth 24". In the style of E.W.Godwin. Height 51" 125cm, Width 50" 127cm, Depth 14" 37cm. Bruce Talbert (attributed), probably for Gillows, an impressive Aesthetic Movement ebonised cabinet for semi-fixing, with a gentle play of upper open shelves with turned uprights and turned legs and decorative brass beadings, gilt highlights, amboyna inlay to the central drawer and doors with painted panels of maidens amidst classical swags in the Greek style. The handles and hinges are identical to those used on many pieces designed by Talbert and made by Gillows. Height 75", Width 29 3/4", Depth 13". A superior quality Gothic Revival Walnut Dresser with turned gallery to the top and outstanding stylised floral and leaf carving the flowers highlighted in Gilt, with 4 turned supports below with ebonised high lights and open display area, a bank of crisply carved alternating florets beneath, the sides and doors with ebonised and Gilt highlighted tramline details and quality handles, the doors opening to reveal shelved area for storage. Approx Height 6' 11", Width 5' 1", Depth 20". 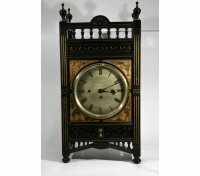 An outstanding mantle clock attributed to Dr Christopher Dresser, the style and period of this clock all point towards Dresser, having eight-day fusee quarter chiming and striking movement on bells and gong made by William Tucker, who Worked in Bristol between 1862 - 1900. 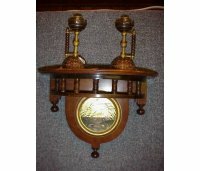 It has a beautiful chime and is in full working order. Height 26", Width 12". Circa 1870. 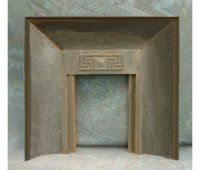 An Anglo-Japanese cast iron fireplace with curved sides and honesty motif with rose detail to the centre.